We hope you enjoy our home as much as we do. Chango Villa was designed to create a unique and once in a lifetime vacation experience. 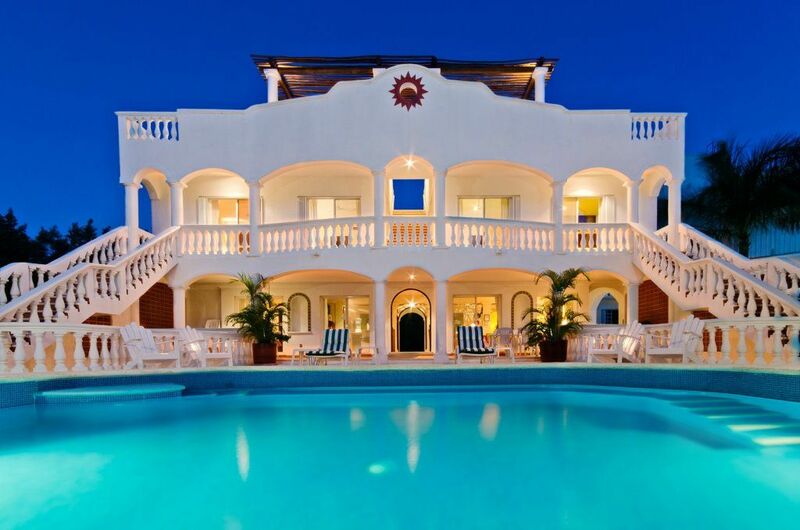 This 7 bedroom villa is perfect for multiple uses. Whether you are a family looking for a spacious vacation home offering privacy and total luxury, a large party wanting to experience some of the best scuba diving in the world, or a group of multiple families looking for a unique vacation alternative, Chango Villa provides the best accommodations Cozumel has to offer. private beach and having a villa in the world famous protected marine park. All bathrooms are designed with authentic Mexican talavera tile and very large walk in showers. Each bedroom has its own private bathroom complete with sink, shower, toilet, towels, and paper products. The villa is directly on San Francisco beach (Playa San Francisco). Snorkeling with 200 feet of underwater visibility directly in front of the villa. White Sandy beach. Endless beach walks. Enough parking for 4 jeeps or cars in the main villa parking area. Additional parking available on the front road. Beautiful property with excellent service! Everything was as promised for the excellent vacation. We had four families stay the week here and the location, property, and service was amazing. Jessica was our dive master and was incredibly friendly and helpful. We sent lots of emails before our trip to make our plans and she was simply kind and informative. We took her up on each of her suggestions for dinner out and were glad we did. Having the beach clubs close was fun but it was even better to just sit on the private beach to watch the sunsets. The daily cleaning service was so helpful. We cooked ourselves as we have some in the group with special dietary needs. Thank you to our hosts who provided us with a relaxing vacation. This house was amazing! Loved every moment! We are all still talking about this trip! The house, the rooms, the pool, the staff! This was our first time sharing a home vs a hotel. I would highly recommend it. We definitely felt spoiled after leaving here. We will for sure be back, sooner than later! We just returned home to Minnesota after a spring break at Chango Villa with our family of 12. Grandma and Grandpa planned the trip for all right down to the 5 grandchildren ages 2 to 12. Best trip ever! We felt very safe at Chango Villa where the house and setting are spectacular! So much space for all with 3 levels of living space and the roof top, all beautifully decorated. The setting is extraordinary! This property is right on the sandy beach with views of the Caribbean Sea throughout. We spent most of our days relaxing and playing in the perfect pool (elevated and so cool!) and/or on the beach. The palm trees surrounding Chango are gorgeous and provide shady areas to relax in a hammock or read a book in the chairs on the beach. The staff is amazing. They couldn't be nicer or more accommodating, meeting our every wish and cleaning to perfection every day, even the windows! Gabby was our chef for the week and our meals were delicious and beautifully presented. Better than going out for sure with the family. I would highly recommend this service. It was such a treat for the ladies not to have to grocery shop, prepare meals and then clean-up! Who wants to spend vacation doing what we do at home?? We enjoyed 2 meals a day, breakfast and dinner. Pretty incredible watching the most beautiful sunsets at dinner every night. We ate outside on the veranda every day. Table is colorfully set for every meal. We're still talking about what a treat it was to have Gabby and her cooking staff. Jessica provides the Concierge Service. We ordered some groceries and liquor through her, some things for lunch if we didn't walk down to Carlos and Charlies. Best of all, Jessica sets up all our scuba and snorkeling adventures with the best guys ever. Jamie came to the pool for diving instructions for all those who were interested the day before the dive. And JJ's Paradise snorkeling excursion was just too much fun. We did it twice! No better way to spend the day with an entertaining guy like JJ who knows it all out there above and below the sea. Watching him "free diving" while we are snorkeling around the reefs was something else! Then he throws out the fishing line as we travel to lunch on a private beach and catch a big mahi mahi to add to our shrimp dinner! It goes without saying that I would highly recommend staying at this very private property. Makes one feel pretty special. We will definitely be going back! Me and my friends from school had an amazing time at the villa! It had a great beach-front location, with numerous amenities. The pool, scuba gear, paddle boards, and kayaks were used on the daily. We also contacted Jessica, who is the villa's concierge service, helped us organize excursions, transportation into town, and dinner reservations. We went on a boat tour with Jay Jay (which I highly recommend). Snorkeling and visiting the beautiful El Cielo was complimented with food, refreshments, and booze. So fun! In the evenings we would hang out on the roof, and watched the most beautiful sunsets. Albino and Laura were also wonderful! The property was very clean and well-maintained. It was a great experience, and I hope we can visit again very soon. The stay of a lifetime!! Chango Villa was a beautiful house with an incredible view out across the ocean. The location was fantastic and we also had access to the scuba gear and paddleboards which was a great way to spend the day at the beach. The customer service was perfect; the staff were extremely kind and helpful throughout the duration of the trip. I would highly recommend Chango Villa for anyone looking for a beautiful house that will make for a memorable stay in Cozumel. 10/10!! Amazing property with spectacular views! Chango Villa was as beautiful as it looks in the pictures. Everything was in impeccable condition and the owner provided great service. I highly recommend to anyone looking to vacation in Cozumel!